Feather weight Best Quality Sidelock Ejector Light Game Gun. Fully engraved with bold Foliate scroll work and with vignettes of feathers to the sidelocks and trigger guard. 28 inch barrels and straight stock. 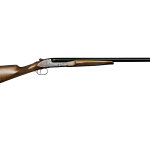 This gun has not been overly used and it retains much of its hardening color. The gun comes with a leather case with CB VAUGHN label. Very nice. More information and pics will be added at a later date, thanks.